Rolling the dice and hoping for a hit, or at least something that earns enough to fund the development of another game, is not a serious strategy. And there are a lot of new new indie game developers struggling with motivating themselves to work on their projects for more than a few days at a time before the pain of the creative effort overwhelms any enthusiasm they had to be a game developer. There are always posts online asking for tips of staying motivated. At the most recent IGDA meeting, I presented an updated version of my 2014 talk Playing the Long Game: The Vital Importance of Purpose, Mission, and Vision to Your Indie Game Development Business. I’m running my business part-time as I have a day job, but doing a poor job of running GBGames as a full-time independent game developer from 2010 to 2012 taught me some major lessons about running a business. Other indie game developers could benefit from my experience. Knowing who you are and what you stand for will go a long way towards reducing the stress and pain and fear that can otherwise be a regular part of running your own indie game development business. At the very least, it will give you the energy and motivation to keep working on your projects for the long haul. Limiting Screen Time for Your Kids Isn’t Necessary? And I have felt self-conscious about rubbing my eyes after long sessions in front of the computer ever since. But the main point is that I have always had this internalized idea that too much time playing video games or watching TV is bad (although it didn’t stop me from playing Civilization all night once…ok, a few times…I can stop taking turns anytime I want to!). There were health reasons, and there was also the idea that I should get outside into the fresh air more, or be more social. As a game developer who is interested in creating entertainment that encourages curiosity, supports creativity, and promotes continuous learning, I would love to be able to watch my niece play the games I make and get not only real-time feedback but also help her on her journey to becoming a terrific person. But when I visit, I find myself wondering if perhaps I shouldn’t contribute to even more of her screen time, as I almost invariably find her playing video games either on a tablet or on the computer. I know some people who use screen time as a reward for doing chores or good behavior, and taking away screen time is a punishment. By and large, their kids are not allowed to play games or otherwise use computers recreationally for more than so many hours per week. Well, that’s good news. Playing too much Minecraft or Halo isn’t what leads your kids to becoming disaffected youth. Whew! What’s more, Ferguson argues that since computers are so integral to society and how we live and work, preventing children from become familiar with modern technology is likely to prevent them from being able to participate in our increasingly fast-paced lives, which is the exact opposite of the result many parents might want when they limit screen time. Funny, I’m pretty sure that was the argument I used to convince my parents to get me Mario Paint, which came with a mouse peripheral. Naturally, our focus can shift from how long children play games to what games they are actually playing. I’m reminded of Steven Johnson’s Everything Bad is Good for You, which argued that today’s TV and video games are actually more challenging than they were decades ago, and so children watching TV and playing games today are essentially training themselves in decision-making and other important skills. Even if too much screen time isn’t a real issue, I still might pry my niece away from games periodically, if only to be able to catch up and spend quality time together away from the screens. But the Ferguson’s study made me feel more comfortable letting my niece play games that teach responsibility and strategic thinking such as Toytles: Leaf Raking. Of course, I also think a well-rounded video game education is in order, starting with the classics. Most game AI literature covers the basics in a general way, such as finite state machines, flocking and steering to control movement, pathfinding algorithms such as Djikstra’s or A*, goal-oriented action planning (or GOAP), and more. 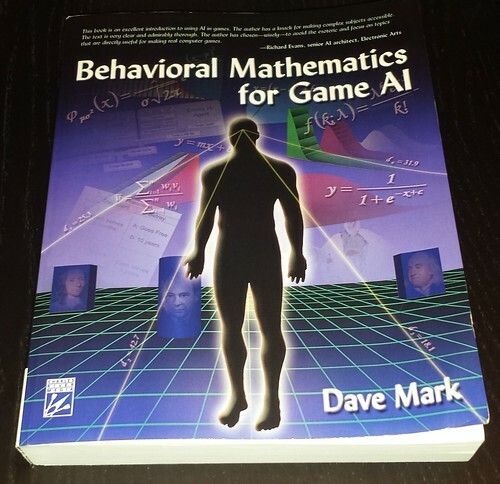 Mark’s book, however, covers a specific topic in great depth: game AI decision-making. You might have a character that can do interesting things such as hunt, flee, eat, track, alert nearby allies, etc, but if you don’t create a good system that allows that character to make decisions between those behaviors, it may not convince your players that it is intelligent at all. The goal is to create behavioral algorithms to get computer-controlled agents responding to their environment in believable and sensible ways. To get there involves a journey through the subjects of psychology, decision theory, utilitarian philosophy, and probability and statistics, among others. Mark was great at walking you through each step of this journey, combining theory with detailed explanations and examples, including code. Sometimes I felt the detailed explanations were a bit too detailed, but at no point did I feel like I was lost. He never made a leap in logic that left me behind because he was holding my hand at every step of the way. Sometimes I appreciated that hand-holding, especially for the more involved statistics, but there were a couple of times when I found myself getting a bit impatient and wanting to run ahead. And it is probably partly due to the fact that it’s a long journey. At one point, I realized I was over 300 pages into the book without feeling like I knew how to integrate and apply all of the individual tools I was learning into a cohesive system. The examples he used to illustrate his point were sometimes bizarrely relatable. I have never tried to create a model of my behavior related to when I decide to replace my older razor blades with newer ones, but Mark did, and I actually found myself nodding with recognition that I do tend to use my last blade in the refill pack for way longer than my other blades. Other examples demonstrate how his utility-based decision-making system can address problems with past games, such as the strategy game AI that kept sending its attack force towards the most vulnerable target. Savvy players can keep defensive forces outside of city walls, then place them in the city at the last moment and moving units out of a city far away. By doing so, they could keep the AI units moving back and forth, unable to carry out an attack, for as long as they want. Solving this issue involves giving the AI the ability to have decision momentum by making decisions include all of the relevant information. The AI isn’t just deciding what city to attack. A single decision is what city to move to AND attack, which incorporates the time it takes to travel to a target city. Suddenly, the decision to change course in order to attack a different city is a bit more painful, and so the current target is more likely to be maintained. I appreciated that he covered the problem of having the AI always making the best decision. While academic researchers might love that result, players are likely to find such AI as unrealistic and, worse, uninteresting. And if there are multiple AI agents that do exactly the same thing simultaneously, it’s even more of a problem. So there’s an entire chapter on ways to ensure that the game AI can be reasonable yet still interesting from one play session to the next. The book was published in 2009, and so you would think it means that any information you could glean out of it would be obsolete after almost 10 years of advances and progress in the field. And yet, the basic decision-making system that drives behaviors is still relevant. One of the benefits of reading an older book is seeing the ideas of that book illustrated in front of you in other media. You can see Mark’s talks with Kevin Dill from GDC 2010 and 2012 in the GDC Vault. Improving AI Decision Modeling through Utility Theory and Embracing the Dark Art of Mathematical Modeling in AI both introduce the use of this utility-based system in games. In 2013, Mark’s portion of the panel Architecture Tricks: Managing Behaviors in Time, Space, and Depth introduced the Infinite Axis Utility System, which takes the concepts from the book and puts them together into a simple yet powerful architecture. In 2015, Mark and Mike Lewis presented Building a Better Centaur: AI at Massive Scale, in which they describe the Infinite Axis Utility System that was the architecture behind an MMO. I’ve seen these videos before, but having now read the book, I found that upon rewatching them that I understand the sections on response curves and how they apply to the actions the IAUS chooses. Behavioral Mathematics for Game AI is not a beginner’s book at all, but if you are interested in learning how to give your AI powerful reasoning abilities that produce rich, believable behaviors for your players and want it to be easy to understand and design with, I’m not aware of another book on the subject that is as accessible as this one.